What can I say? 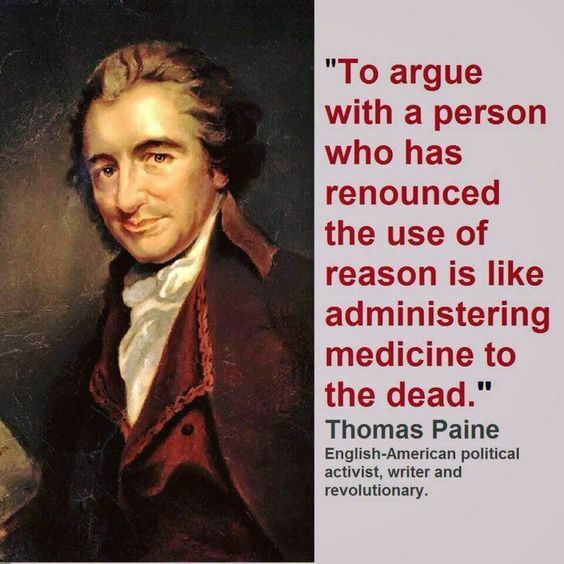 Tom Paine warned us. And today, we see our much-vaunted FedGov (to say nothing of tribal and state and local governments) in the control of insane idiots. People who cannot reason, cannot use logic, cannot understand the difference between reality and their fantasies. For too many politicians, trying to argue with them has no more success than trying to argue with a two-year-old (if not younger). Because we have given so much power to governments, we suffer daily because of their mad behavior. This entry was posted in Nathan's Rants and tagged government madness, insanity, madness, quotes, reason, Thomas Paine, Tom Paine. Bookmark the permalink. Q: mr. Einstein, in your opinion what is infinite? A: the universe and human stupidity. i am not absolutely certain of the former. may not be the exact wording, but is close. just from that quote, you can infer genius. We have not given it to the government, they took it. HOW: convincing the public to elect them all the time and they will go good for us. Wait: you are right, we believed them, but at least some of us did not.